As a consultant and a former Communications Director for a national nonprofit, I've had a lot of experience with vendor agreements. As much as one would think these documents are standardized, I've seen quite a range of styles, formats, and degrees of specificity over the years, which serves to only reinforce that fact that both consultants and business owners must review contracts very carefully, question any unclear language or deliverables, and make sure they are comfortable with all elements of the contract before signing on the dotted line. In the case of social media management, a deliverable would be: social media updates via Twitter and Facebook, to be completed twice daily, for a period of one month. 5. Non-compete: A non-compete clause is important to include for most businesses as a form of self-protection. I have seen all kinds of language related to this, ranging from the amount of $10,000 should a client approach a business originally sent to them by a vendor, to double and even triple that amount, depending on the circumstances. Typically, a period of time the non-compete is in effect is outlined, and can be anywhere from 6 months, to 1-2 years. Small businesses and sole proprietors need to exercise caution that the amount stipulated could not effectively wipe out their business, and must be comfortable with the amount they are signing off on. 6. Fees and billing: It should be clearly outlined how much and when the project is to be billed out. Typically, consultants require a fee of half the total upfront, with the remainder due at the completion of the project, at Net 30 days, allowing for a full billing cycle. 7. Period of review: It should be specifically stipulated at what point the parameters of the contract will be revisited, revised, and expanded or otherwise changed. An assessment at the end of each month is fair in many cases, as it allows a suitable time period for the project to develop and get underway. 8. Signatures: It should be clear anywhere that signatures are indicated, who the signatories are, including their titles and functions within the company. It should also be stipulated as to what qualifies as a legal signature. 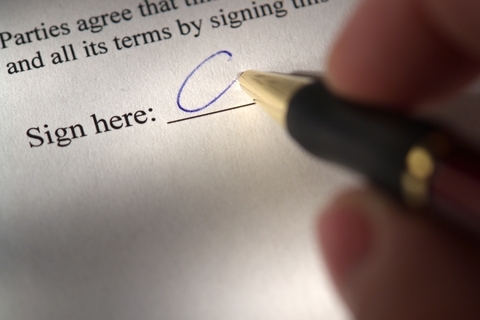 Some more informal contracts allow for a written email signing off on the contract, but a formal contract requires a full signature. There are many electronic signature companies that provide this service. In the past, I have included my written signature, and then scanned and emailed the document, followed by a hard copy version via snail mail as well. 9. Expense Reimbursement: If the payment is a flat fee meant to cover all expenses, this must be stated. If in some cases, expenses may be reimbursed, this should be stipulated, including how much advance notice is required, the purpose of the expense, what paperwork is required as backup documentation, and what the maximum amount is. 10. Other: This is more from the consultants angle, but I typically include a provision that I can include my work with the client in my marketing and communications materials, such as website, blog, e-newsletter, etc., and that if there is a request for confidentiality either on the part of the client, or the client's client, it must be stipulated. I also request that, assuming all goes well, the client will provide the consultant with a written and/or video testimonial. Many businesses may not realize the importance of this for consultants, but it is a key factor in marketing their business, and clients need to be reminded of this. A good contract should be an accurate reflection of previous discussions and communications that have taken place about the project and scope of services. However, I have found that often contracts contain new information that either does not relate to the project at hand, or may relate, but requires clarification. Sometimes, this can be the case when a vendor has a standard contract they use for a multitude of scenarious, that may not be relevant in this particular instance. It is crucial that the consultant review the contract for these "surprises." They may not require deletion, but they certainly should be clarified, particularly if they are new pieces of information. Sometimes, a proposal is confused with a contract. A proposal is sometimes requested by the vendor, so that the main focus of a project can be clearly outlined by the consultant, as the consultant sees it, and then used to draw up the contract. If there are essential elements of a proposal not included in the contract that are crucial to any aspect of the work product, the proposal must be reference or restated within the contract. A proposal tends to be preliminary, while a contract seals the deal and firms the commitment. I have experienced several instances where a vendor changed the deliverable halfway through the project. This can happen for any number of reasons - a new need has emerged, or an unforeseen project suddenly takes precedence. Unless the consultant is on a retainer that encompasses a variety of scenarios as they arise, the contract must be revised to reflect the new project, as well as any changes to the current project. This assumes that the consultant is flexible, and is willing to take on the new project. Depending on the timeframe and the status of the current project, either an entirely new contract needs to be written that includes all the specifications described above, or the current contract needs to reflect the new adjustment made. Unless there is a significant deadline, I suggest whenever this occurs that the current contract be completed, and a new contract written to describe the upcoming project. In this way, the two deliverables are not confused, and the fresh contract addresses all the parameters of the new project accurately. I'm sure all of you have had your share of experiences with contracts...and I didn't even have time here to go into a very important aspect of all this --- copyright and work-for-hire issues. What have I left out? Comment on your experiences here!